Six of Cups (R) says that after experiencing disappointment and hurt – you face the real test – are you willing to accept an apology, to forgive and let go of the pain? Love with the trust and receptivity of a child and out of this pleasurable experience you will be regenerated and renewed to such an extent that pleasure and the sense of pleasure will be extended to everyone around you. “Delays” only test your strength and will – do not react – just be quiet, still and center yourself within. When a special event that you have been looking forward to is postponed – be willing to release it and accept the changes. When you experience disappointment with something received – consider releasing yourself from that relationship or stifling situation. You have been “down” too long – focus your attitude and move towards action – always look towards the future. Disturbed memories from the past are creating these feelings of alienation as you experience the breakdown of a relationship which was based on one person protecting or teaching the other. Let go, experience your grief and you will be regenerated. Cry and your light will shine again. Liberate your feelings and you liberate your spirit. Nostalgia to a fault (yearning to return to the past or an unrecoverable condition). Sentimentality – too much family/friends . You cannot extend for the sake of extending. Rushing into or extending relationships with people not suited for or appropriate to your path. Just as we are not meant to bed with or mate with everyone we meet – neither are we to bond with just anyone. Many tests of give and take reciprocity are required. Being a blood relative is automatic but it does not entitle one to privileges not earned. All relationships must establish their mutual bonds of love and respect by their actions – not by their birth and in the case of marriages – not by fact of law. Bad memories – too emotional for the given circumstances…insincere flattery. What memories or relationships from the past have reappeared? What insights or awareness have they provided? What is renewing and revitalizing you? What is bringing you pleasure? How are children or childlike enjoyments meaningful in your current situation? What do you give in friendship? Next to Moon: You still have concerns from a misunderstanding in the past – see the situation realistically now and put it to rest. Next to Strength: You can now achieve your goals as old dreams become new, shining, attainable ideas. Next to Hierophant, Emperor or Empress: A Karmic lesson must be understood and corrected – a meaningful relationship is clouded with misunderstanding or the lack of tolerance. In the first position: The emotional/creative demands made upon you may be great, but nothing so great as to interfere with completion of your karmic purpose. Just the opposite, all difficulties will support your purpose. In the second position: Your reserves may not be what you think they are. You may not be able to call in your chips. In the third position: There has been a serious imbalance here and it is urgent that it be corrected now. 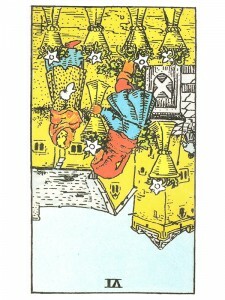 Review the general meaning (inverted) of the Six of Cups for guidance if necessary. In the fourth position: This person requires the immersion in a thick family atmosphere with rich interdependence. In the fifth position: You are aware that you are expanding your capacity for loving, healing and all affairs of the Emotional/creative plane and advancing your emotional path. You are mentally on top of these emotional matters, but…perhaps you have decided something incorrectly. Think carefully – who is doing what for whom? Are the energies flowing in the right direction? In the sixth position: In the near future there is an act, or a wave, of emotional generosity that reverberates through your life and the lives of your loved ones. This emotional exchange will be more than the doctor ordered – perhaps embarrassing, perhap infuriating. In the seventh position: There will be concern about the nature and benefit of relationships with your loved ones. Honestly and sincerity may cut through some of your weaker ties. In the eighth position: At one extreme, there is insincere or rude behavior with a negative effect on the audience. At the other extreme, the emotional outpouring is so genuine and strong that it can surpass making someone’s mood improve, it can help facilitate a cure in someone very ill. This is the healing power of the touch of love. In the ninth position: The family or extended family may be wrecking havoc, insincerity, taking advantage. In the tenth position: There has been a serious imbalance here and it is urgent that it be corrected. Review the inverted general meanings for guidance if necessary. Be honest with yourself and sincere with others.